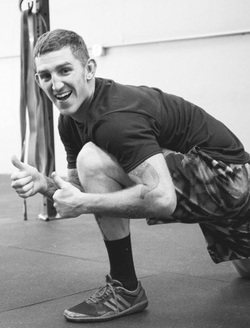 With an athletic background in competitive mixed martial arts, Brandon has expanded his athletic experience to include triathlons, Olympic lifting and CrossFit. Brandon served in the Marine Corps., worked as a personal trainer and is currently employed as a firefighter at Lacey Fire Department. Teaching and improving the health and fitness of others is Brandon’s goal when coaching. He currently has his CrossFit Level 1, CrossFit Kids, USAW (USA Weightlifting Certification), CPR/AED certified and plans on bringing Cross Fit Striking to CrossFit Lacey. He attended a 2-day Outlaw Barbell Camp with instructor, Jared Fleming, where the finest details of the Olympic lifts were broken down. Buzz is excited to share his newfound knowledge with the Outlaw Barbell Club.